friendship is a strange thing. My son is nine years and does not always find it easy to make friends, yet appears well loved by most of his class in school. When he does begin to develop a deeper friendship those friends end up leaving the area…..not because of him but due to change in family circumstance. 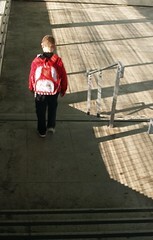 Yesterday he came home from school and his best buddy had announced that his family was emigrating. My son looked at me and asked whether he should stop making friends because they all leave! Growing up is a tough thing to do but it strikes me that we are often like this in youthwork settings. Thankfully things are changing but there are not many youthworkers/pastors etc. who manage to stay in a place for 8 years or more. This time setting would enable you to work with just one age group through all their teen years…..I wonder how many young people choose not to build trust in their youth worker/leader or pastor because they do not know if they will leave too soon? One for me to ponder. Hey Roy, I’m coming up for my 10th year working in the same town. It’s been a real joy to see kids become teenagers and teenagers become adults. I do clearly remember working with one young lady when I first started. My boss filled me in on her particular background and the awful situation she grew up in. I worked with her on and off for about 7 years, but it wasn’t until about 3 years in to the relationship that she told me in her own words about her life. It took her those 3 years to trust me enough to confide in me. I think workers should look to commit to a job or post for 3 years minimum (in thought rather than contractually) as it’s only after that amount of time that you can start to see change happen. that is exciting. I have changed jobs but stayed in the area for nearly 10 years. It has been important for me to stay in the area as I have some solid relationships from each “workplace” and staying around has enhanced the connection, so although the job role may have changed the relationships have not been damaged. The flipside to this is that I have had to ensure good communications with those that replaced me to prevent misunderstanding or misinterpretation from the newer youthworkers. Can be a difficult balance but worth persevering.